his father was betrayed by his own kinsmen. and shared his meat. Abiola is a native of Ogun State, south- west Nigeria. should be posthumously conferred with the title of the former president. bring back the late politician. didn't want him to do that. only trying to make the country better. into pieces and shared his 'meat'. to a man who was no longer alive. when he's no longer alive to accept it? They should keep the mandate. injustice, hopelessness, insecurity and corruption. There is so much rot in the country." 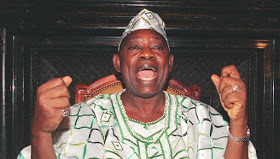 0 Response to "Yoruba People Killed My Father And Shared His Meat – MKO Abiola’s Son"